At approximately 7:30 pm, on Friday, December 22, 2006, Metropolitan Police were called to the 700 block of 16th Street, NE, for the report of a shooting. Upon arrival, officers located 17-year-old Antonio Jenkins, of the 1700 block of Gales Street, NE, suffering from multiple gunshot wounds to the body. He was taken to the Howard University Hospital and admitted in critical condition. At 7 pm, on Saturday, December 23, Mr. Jenkins was pronounced dead. 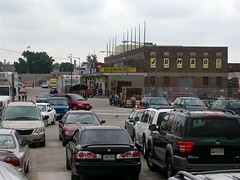 At approximately 9:48 pm, on Monday, December 25, 2006, Metropolitan Police were called to the 2000 block of 3rd Street, NE, for the report of a shooting. Upon arrival, officers located 29-year-old David E. Watkins, of the 2000 block of 3rd Street, NE, inside of a vehicle and suffering from apparent multiple gunshot wounds to the head and body. He was taken to the Office of the Chief Medical Examiner for the District of Columbia and pronounced dead. An overloaded extension cord being used in a rear bedroom is being blamed for a fire that destroyed a home in the Brookland [Woodridge] section of the District. The fire broke out around 4:45 a.m. on Saturday in the 2100 block of Monroe Street, Northeast. D.C. Fire and Emergency Medical Services Department spokesman Alan Etter says the fire destroyed the single family home, and left seven people homeless. Etter says two men, 19 and 34 years-old and a 17-year-old woman were taken to George Washington University Hospital for treatment of burns and smoke inhalation. A woman took three boys, ages 12, ten and four to Children's Hospital to have them checked out for possible smoke related injuries. Firefighters estimate the damage at $450,000. Additional information can be found on dcfire.com. If anyone knows the family and what assistance/items they may need at this time, please leave a comment. Mayor Williams has scheduled a(nother) vote on an emergency library bill next Tuesday - despite others not passing. Williams believes "all the issues have been ventilated." Wow. Interestingly enough, many of us don't agree. In addition to contacting your and others' Councilmember [see Council contact information in previous posting here], you can sign this petition to save the MLK Library. And, honestly, if you're for building a new library on the old convention center site, that's a valid option, but at the very least demand more accountability from the current and incoming Council, as well as the DCPL Board of Trustees and Ginnie Cooper. Rebuilding Place in the Urban Space goes into more detail on DC residents' MLK Catch-22. Oh, and it looks like the Council will also be making a final reading and vote Tuesday, December 19th on temporary legislation on the Florida/Capital City Market (scroll down their schedule for "New Town at Capital City Market Revitalization Development and Public /Private Partnership Temporary Act of 2006"). Read some of Richard and Elise's comments on the proposal and search their sites for more. No fun - it's been determined that norovirus is behind the recent surge in gastrointestinal "issues" at CUA (I tried really hard to avoid any puns there...oh well). Those of us off campus, but in contact with CUA students at the Metro and in the neighborhood, should take extra precautions as well. About 80 fourth, fifth and sixth graders at Bunker Hill Elementary in Northeast made history Wednesday, as they broke a world record for reading. The Bunker Hill schoolchildren were among the 547,826 students from 28 countries worldwide who broke the Guinness World Record for the "Most People Reading Aloud Simultaneously in Multiple Locations." Their book of choice? The students all read from the same chapter of E.B. White's Charlotte's Web. At 12 p.m. Eastern Standard Time, the reading began. When the chapter was over, cheers erupted from the halls of Bunker Hill. Incoming D.C. Police Chief Cathy Lanier and Howard University Assistant Vice President Raymond Archer were among the official witnesses. The previous record was from 2004, when 155,528 students from 737 schools throughout the United Kingdom read William Wordsworth's poem "Daffodils," according to Guinness World Record. Ralph Bunche House for Sale? I follow an RSS feed of a ZipRealty real estate search within 1 mile of my house, and MLS# DC6260757 DC6264005 at 1510 Jackson Street, NE caught my eye at $1,750,000 (you can view it by creating a login at ZipRealty and putting in the MLS, or without a login on HomesDatabase). The address isn't correct - the Bunche House is at 1510 Jackson Street, NE - but the details, like year built and style, not to mention the astronomical price, match. I drove past yesterday, but neither 1510 nor 1514 had a sign in the front yard, and 1514 looked far more occupied and maintained than the Bunche House. 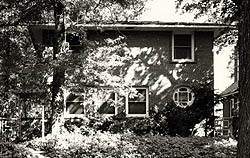 » DC Preservation League (2001 Most Endangered Places List): "...this DC and National Register listed landmark designed by architect Hilyard Robinson in the International Style has been inappropriately altered and turned into a residential facility." Does that mean it has served as a group home? The listing does mention a ramp on the main level. » National Park Service: "Among Robinson's notable works in Washington are Langston Terrace, and several campus buildings at Howard University." » Cultural Tourism DC: "Bunche was one of the first African Americans to move into the formerly segregated Brookland neighborhood." » Nobel Foundation's bio of Ralph Johnson Bunche: "From June of 1947 to August of 1949, Bunche worked on the most important assignment of his career - the confrontation between Arabs and Jews in Palestine....Bunche returned home to a hero's welcome. New York gave him a ticker-tape parade up Broadway; Los Angeles declared a "Ralph Bunche Day." » Ralph Bunche on Wikipedia: "[Bunche] received the 1950 Nobel Peace Prize for his mediation in Palestine in the late 1940s that led to an armistice agreement between the Jews and Arabs in the region. He was the first African-American to be so honored in the history of the Prize." What: Join the NE DC Historical Society as they continue to explore the history of our Northeast Washington communities - past, present, and in years to come. This month's community history focus will be the John T. Rhines Funeral Home, a thriving DC enterprise celebrating its centennial year. Presentations will include: "The John T. Rhines Funeral Home—Our 100th Year" by Gretchen Shorter Roberts, Historian, and more. Etc. : For those unable to attend this meeting, don't miss next month's meeting to be held from 2-4pm on Sunday, January 14th, 2007. We will again reach out beyond NE DC to discover more of Washington's historic neighborhoods — this time, Georgetown! Our community host for this event will be the Mount Zion United Methodist Church at 1334 29th Street, NW. Our presenters will include Carter Bowman (historian) on "The Mount Zion United Methodist Church And Community: One Hundred Ninety Years of Institutional Building"; Ida Jones (Howard University's Moorland-Spingarn Research Center) on "We Have Come This Far By Faith—Methodism in Georgetown"; and C.R. Gibbs (author, lecturer, and historian) on "Facing The Rising Sun: Washington, DC's First Black Vote." Contact queenstowndc@yahoo.com for furhter information. It's quite possible you didn't even know that Tibet Collection's warehouse is right here in NE, within walking distance of the Fort Totten Metro. As one of the founding members of the Fair Trade Federation, Tibet Collection operates an innovative wholesale and retail mail-order company with a national focus and unique business vision. Tibet Collection is dedicated to providing economic opportunities for Himalayan artisans and promoting greater awareness of Tibetan culture. Since our incorporation in 1990, Tibet Collection has focused on marketing high-quality handcrafted goods created by artisans engaged in fair trade business practices. To Wonkette readers - thanks for stopping in....I'm guessing this isn't as exciting as you may have hoped, but, by all means, give the DC police a ring at 202.727.9099 or 1.800.673.2777 if you've seen Shawn. What: Washington Glass School Annual Open Studio Holiday Party - see, among many others, local artists and bloggers Sean (and here) and Rania. 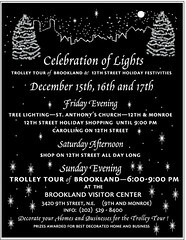 This year's Celebration of Lights, a three-day event that features a variety of activities on Historic Brookland's Main Street as well as Trolley Tours of the neighborhood's elaborate holiday light displays, will be held on Friday, Saturday, and Sunday, December 15-17. A Tree-Lighting event on Friday night at 6:30pm will kick off the Main Street Open House weekend, which includes caroling and other performances along 12th and 9th Streets NE, Friday late-night hours in gaily bedecked galleries and shops, craft demonstrations, special sales, refreshments, and a complimentary shuttle that will transport shoppers and revelers between areas of activity. Santa is expected to visit Main Street on Saturday. 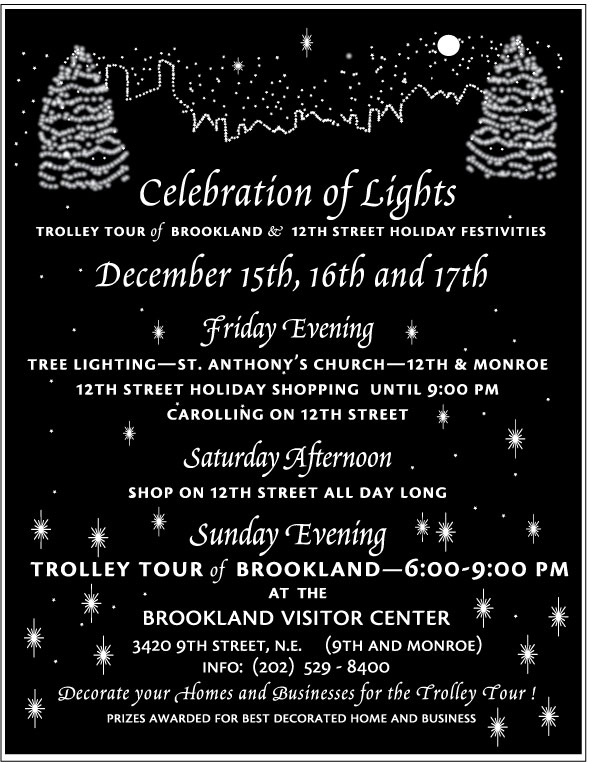 The Celebration of Lights Weekend is sponsored by The Brookland CDC and its Historic Brookland Main Street Program. 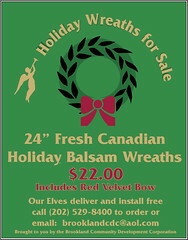 The wreaths are in and are beautiful - order one while they last! You can order your holiday wreaths directly from the Brookland CDC! Proceeds from the Wreath Sale will benefit this year's Holiday Celebration of Lights Trolley Tour on December 17th, 2006. The Council has given preliminary approval - without minimal input from the current businesses and surrounding community - to Vincent Orange's "New Town" proposal which would raze the current Florida/Capital City Market. No, it's not pretty, but it's far from "blighted." I don't have time to comment right now, but keep checking in, and take a look at the reactions from both Frozen Tropics and Rebuilding Place in the Urban Space. You can also read the Post's take here. What: At the request of residents, ANC 5A-07 Commissioner William Boston has coordinated an emergency meeting with MPD-5D Commander Jennifer Greene and Ward 5 Councilmember-elect Harry Thomas, Jr. to discuss the circumstances surrounding escaped armed robbery suspect Shawn Ryan Burrell. 2) it precludes contracting for the new library until contracts have been issued for construction of the four currently closed branches. All advocates for library services are urged to consider contacting Councilmembers if they have a strong opinion about this legislation and how it may affect the revitalization of our public libraries [see Council contact information in previous posting here]. On Friday, December 1, 2006, police arrested 19-year-old Shawn Ryan Burrell and a 15-year-old male juvenile in connection with the armed robbery of a nail salon [see press release below]. At approximately 1:10 am on Saturday, December 2, 2006, Shawn Burrell was taken to the Howard University Hospital and admitted after complaining of illness. At approximately 1:00 this afternoon, Monday, December 4, 2006, while under police guard, Shawn Burrell requested to use the bathroom. When he failed to exit the bathroom, officers checked and discovered that he had made good his escape. He was last seen wearing only blue jeans and tennis shoes. He was last seen possibly entering a black or dark colored vehicle near Georgia Avenue and V Street, NW. He is described as a 19-year-old black male, 6’ tall, approximately 160 to 170 pounds with a medium brown complexion. Anyone with information as to his whereabouts or sees him should take no direct action but call police at (202) 727-9099 or the department’s Crime Solvers Unit at 1-800-673-2777. All calls to Crime Solvers are confidential and if a caller provides information that leads to his arrest, he/she will be eligible for a reward of up to $1,000. There is no available photograph of the escaped subject. See photo here. Detectives assigned to the Metropolitan Police Department's Special Investigations Branch, assisted by officers assigned to the Fifth District and members of the Emergency Response Team (ERT), arrested two suspects wanted in connection with the armed robbery of a nail salon located in the 1900 block of Michigan Avenue, NE, at about 1:15 pm on Friday, December 1, 2006. They were arrested later that same afternoon, one in the 1500 block of Newton Street, NE, and the other in the 1400 block of Lawrence Street, NE. The first suspect, identified as 19-year-old Shawn Ryan Burrell, of the 1400 block of Lawrence Street, NE, ran from his apartment building while detectives, Fifth District officers and ERT personnel were searching for the suspect based on reports that he was somewhere in that building. He was apprehended at about 2:18 pm in the 1500 block of Newton Street, NE, after a brief foot pursuit. The second suspect, who is a juvenile, was arrested sometime later in the 1400 block of Lawrence Street, NE. The investigation indicates that Burrell allegedly robbed the business establishment on Michigan Avenue, NE, while an accomplice waited in the getaway car. The other suspect is a 15-year-old male resident of the District of Columbia. His identity is being withheld because he is a juvenile. Both have been charged with Robbery Holdup, Gun. They are scheduled to be arraigned on Saturday in DC Superior Court. The investigation is continuing. Sometime yesterday, stop, blog, and roll welcomed its 10,000th visitor. Thanks - and here's to 10,000 more! What: Wohlfarth Galleries - run by the Brookland CDC's own Lavinia Wohlfarth, is having its annual holiday sale. Details: Many works offered at a 40%-50% discount off retail prices. A number of small works are available. Additionally, used frames in various sizes. If that doesn’t interest you, there’s always a glass of wine and conversation. Art Enables - Outsider Art Inside the Beltway has moved into a new space at 411 New York Avenue, NE. This Sunday, December 3rd, 2006 from 2-6pm, they are hosting a housewarming and holiday party entitled "Raising the Roof & the Rent." Art Enables is an arts-and-enterprise program for adults with developmental and/or mental disabilities from throughout the Washington, DC, metropolitan area. Participants in Art Enables are selected for their interest in drawing, painting and color. They come to the studio on scheduled days to work under the guidance of professional artist-instructors creating and marketing their own outsider and folk art. Their artwork is exhibited and sold in shows at the studio, via retailers around the city and at galleries, markets and special events throughout the region. The program is open to adults with developmental and/or mental disabilities who are enthusiastic about working toward becoming professional artists and who are willing and able to focus on their work for a full studio day. Art Enables demonstrates that the visual arts are an effective training and employment tool for people who may have barriers to cognitive-based training systems but who are interested in drawing and painting. Their ability to express themselves through visual images can operate as the basis on which they build skills and capabilities, become integrated in the community and earn money. More importantly, they experience a growth in confidence and self-esteem as the natural and inevitable result of becoming achievers at something they do well. Visit Fight HIV in DC for more information, not just today, but every day. AIDS in DC also has a comprehensive collection of HIV/AIDS resources. Also check out the The Living HIV Quilt site on washingtonpost.com, including today's article on a grassroots effort to distribute 30,000 free condoms "in targeted District neighborhoods." Finally, support organizations like the Whitman-Walker Clinic or Food & Friends by donating or volunteering - at the very least by Shopping for Life on Saturday, December 2, 2006.